A new year and a renewed inspiration to continue my quest for a healthy lifestyle (albeit with a little not so healthy self indulgence thrown in for good measure). I made these Spinach and Dill Pancakes to serve as Hors d'oeuvres on New Year’s Eve. I wanted something light and healthy with enough substance to fill a hole without that stodgy and heavy feeling. Not too mention they paired wonderfully with champagne. 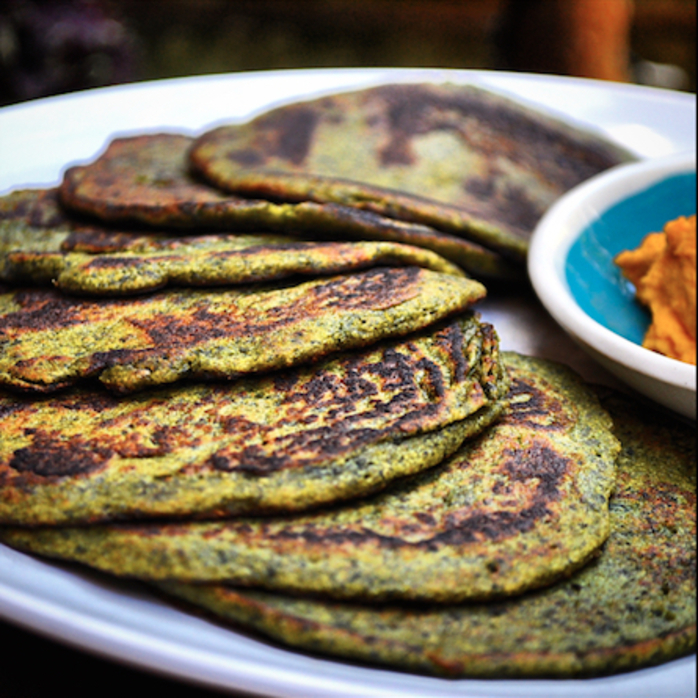 The use of organic buckwheat flour helps make the pancakes light and fluffy; the dill adding extra freshness and flavour, while the spinach has a neutral taste which makes these pancakes the perfect platform to serve with either sweet or savoury fillings and spreads. Their versatility means, you can serve them at breakfast, lunch or dinner or as finger food, and can be eaten hot, warm or cold. It’s also a novel way to get kids (and adults) eating more spinach. Spinach and Dill Pancakes are light and fluffy with a neutral flavour making them the perfect platform to serve with either sweet or savoury fillings and spreads. Peel and dice the green apple. Place in a small sauce pan and cover with water. Bring the water to the boil then reduce to a low heat and simmer the apple until the water completely reduces and the apple is tender and mushy. Use a fork to mash the apple into a puree. Place the spinach, buckwheat flour, apple puree and oat milk in a food processor and blend until a thick batter forms. Transfer the batter into a mixing bowl, add the water, olive oil, and ground black pepper to taste. Finely dice the dill and add to the batter; fold and blend all ingredients until the batter is smooth and thick. Blend the spinach, buckwheat flour, apple puree and oat milk to form a batter then fold through the dill, extra virgin olive oil, black pepper and water. Add a little olive oil or cooking spray to a frying pan and when the pan is hot, place a large dollop of the spinach batter into the centre of the pan and spread into a thin and even circle. Cook the pancake on both sides. 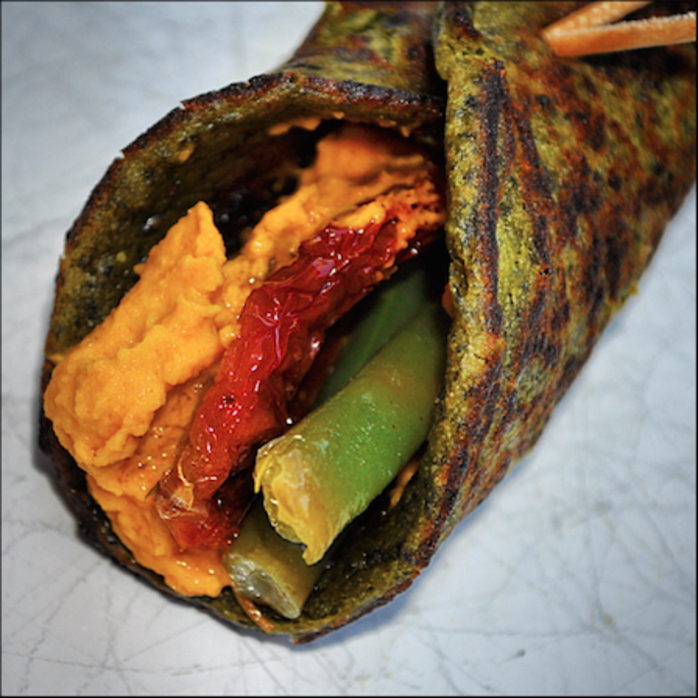 To make the Hors d'oeuvres below, I spread a dollop of Sweet and Spicy Carrot Dip onto each pancake then topped with sun-dried tomatoes and Green Beans then rolled and secured with a toothpick. These Spinach and Dill Pancakes can be enjoyed hot, warm or cold and will make great Hors d'oeuvres when combined with Sweet and Spicy Carrot Dip, Sun-Dried Tomatoes and Green Beans.